In support of their fourth studio album, Promises, international indie band The Boxer Rebellion embarked on a five week summer tour of North America. The group has also been playing select promo dates in the US, including a recent Austin, TX performance at The Parish. 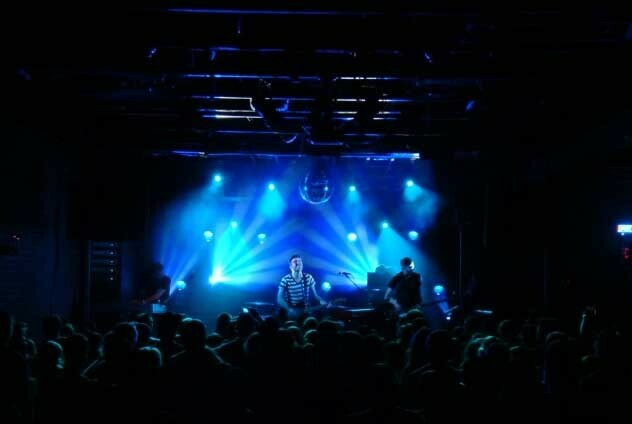 Lighting designer Paul Turner started working with the band during their 2010 SXSW breakout shows under the recommendation of veteran lighting designer Mike Baldassari, and is employing High End Systems SolaSpot fixtures as his primary effects lighting tool for the band's shows. Turner explains: "I had used the SolaSpot on a Comedy Central shoot at the Moody Theatre. It was the first time I'd seen them, and was impressed with their intensity and low power consumption. I thought they would be a good fit for The Boxer Rebellion shows. For me, the output of the SolaSpot - for a white LED source engine - is very bright. Also, the speed's great for a yoke light - it's really fast, especially for a larger format yoke. The optics are amazing; the zoom, focus and rotating gobos are what you expect from High End Systems fixtures. For their cost and size they're very powerful, and you don't need much power to use them!" For The Boxer Rebellion gigs, Turner places the SolaSpot fixtures on the floor. "I try to get the SolaSpots mid-stage and spread out across the length," he says, "so they can turn into the drums plus do all the rock & roll floor fans as well as cross light the band. The zoom has a nice range, but when you pop the prism in it's a very fat beam - and it looks great from out on the floor. They've been great eye candy for these shows." Turner is also using High End Systems control, utilizing Hog4 control software to steer the lighting for the band's North American performances. Detailing his control system, the LD says: "I'm using a Samsung WindowsÂ 8 Tablet running Hog 4 PC, which is much faster than the Hog 3 PC architecture. I also have Hog 3 Programming and Playback Wings, along with two USB widgets. The connectivity setup is so much easier now. It's truly plug and play; my Hog 3 show loaded instantly without any trouble, and it found my widgets right away. The cross-platform connectivity is really great. Many of my clients own their own HES gear, and they really appreciate the fact that their equipment and shows are compatible."